Scottish ministers are considering action against employers for docking the wages of staff who could not make it to work because of the bad weather. The public was advised not to travel during the worst of the snow last week. 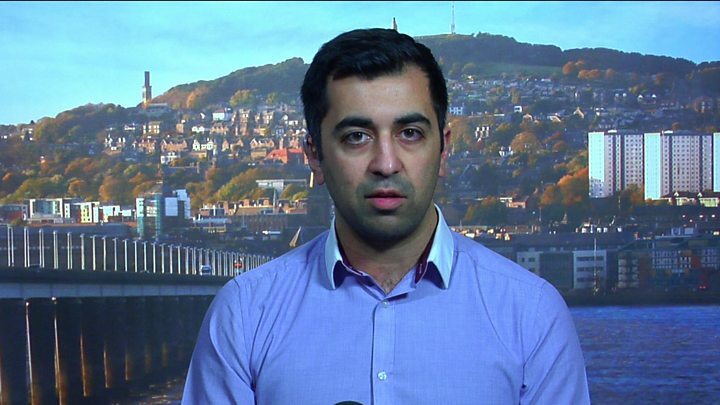 Scottish Transport Minister Humza Yousaf said he had been contacted by people who were facing disciplinary action or potential docking of wages. He told the BBC that was not acceptable and he would look at the legal position. It’s snowing – can I refuse to go to work? His comments come as icy roads and snow continue to cause disruption in parts of the UK but forecasters say temperatures are starting to rise. Weather warnings for snow and ice are in place for parts of Scotland, northern England and Northern Ireland. Many rail services are still affected while three flood warnings are in place. The UK’s economic growth is also likely to take a short-term hit, experts have warned, predicting a “disaster” for the high street as people staying at home turned to online shopping. But temperatures are rising across the UK, with highs of 9C expected in Plymouth on Sunday. Efforts are continuing to get the UK moving again. In Scotland, the main trunk roads are operational, as are the airports, and the railways are getting gradually back to usual service. The west coast mainline reopened between Scotland and Carlisle on Sunday evening. ScotRail earlier said it had a “near-normal service” running across the country. Many rural communities in south-west England which had been cut off by poor conditions can now be reached. On Wednesday into Thursday, Scotland ground to a halt with a red weather warning in place and people told not to travel unless absolutely necessary. He said he had received emails from a number of people who were “facing disciplinary or potential docking of wages”. The minister said the process would involve “talking to employers and having that dialogue with them, and internally looking at what powers we have is clearly part of the discussion we’re going to have”. The team hard at work last night! Meanwhile, the Met Office currently has two yellow severe weather warnings in place, including for snow and ice across a large area of central and eastern Scotland until Monday night. A second warning for ice in parts of north-east England and Northern Ireland is in force until 11:00 GMT on Monday. The Met Office has also issued a third yellow warning of snow and ice for Tuesday covering northern Scotland. The three flood warnings are in coastal parts of south-west and north-east England and are because of high tides, rather than thawing snow. 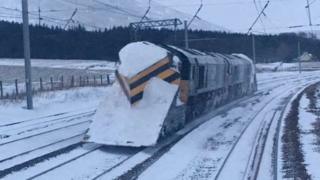 Virgin Trains still has no services running between Carlisle and Scotland on the west coast main line and said it did not expect services to resume on Sunday. It is offering a limited replacement bus service. On the east coast route, Virgin said it hoped to run a “near-normal Sunday timetable” but passengers were urged to travel only if necessary as trains would be busy. 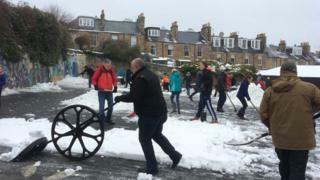 On Saturday, communities answered a call from the Scottish government to work together to clear local areas. 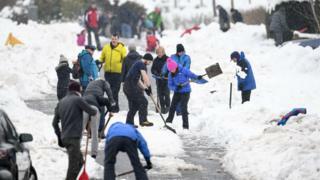 “Armies” of parent volunteers have been mobilised to try to get schools ready for Monday morning. Many schools contacted parents via social media asking for help to clear paths and playgrounds to make them safe for pupils to return. Hundreds of thousands of children have not been in the classroom since Tuesday due to extreme weather. 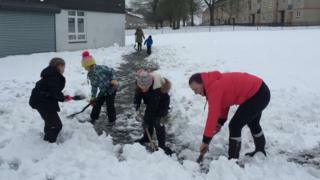 Parents and teachers have already been working to clean up snow from school grounds to allow them to reopen on Monday. Other schools posted appeals for volunteers to gather at specific times to get grounds cleared. Most councils who were forced to close schools last week were aiming to reopen facilities after the weekend, weather depending. The Scottish government has also opened the Bellwin Scheme, set up to help councils who face large costs from damage due to the severe weather. Jennifer Lawrence & Jessica Chastain Have Rallied Around Catt Sadler Following Her Exit From E! News!